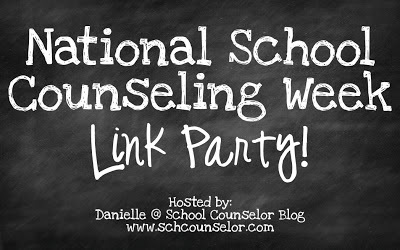 I am linking up this previous National School Counseling Week post to the National School Counseling Week 2013 Link Party! There you will find lots of other posts by school counselors all over the country and how they are celebrating and advocating during National School Counseling Week. You can also share your ideas by participating in the Link Party! National School Counseling Week 2012 is February 6th through 10th! I have a few National School Counseling Week Theme ideas swirling around in my head. I want to share them with you before it is too late for you to plan and get started! I will be sharing one theme/idea in each of my next few posts. The American School Counselor Association has great resources available for planning and implementing National School Counseling Week. The sample morning announcements are great and can tie into some of the themes ideas I will share. Last year I made cards that said "Teachers, Administrators, and School Counselors work together for student success!" and put mini 3 Musketeers in staff mailboxes. This year I want to make the focus more on School Counselors and what School Counselors do to benefit students! I think this is the theme I am going to end up going with this year at my school and for my local school counselor meeting that happens to be during National School Counseling Week. School counselors also connect with stakeholders to support students! I am excited by this theme because most kids know have seen Legos before. I like the idea of taking something students are already familiar with and associating it with school counseling. I think it would be fun to ask students to come up with ways that School Counselors are like Legos or ways that school counselors help students build bright futures. This message would also be cute on a card for teachers and staff including some of the ways that school counselors help students build bright futures... such as classroom lessons, individual counseling, group counseling, school wide programing, etc. I created the "School counselors help students build bright futures!" image above using microsoft word text boxes and shapes. You can download a pdf of it here. I got an idea to do a Lego guessing game from Pinterest. I think this would be fun game for faculty, staff and students! The Lego guessing game super easy to make! I filled a hurricane vase with Legos and printed "Guess How Many Legos!" on a piece of yellow card stock. If you want to print the same size/font I made a pdf file of it here. I can't decide whether I want to stand the sign beside the vase or stick it inside the vase. I thought the "Legos" below were soooo cool. They are actually crayons! I want to give away Lego shaped crayons as a prize for guessing the correct number of the Lego guessing game and for other giveaway/prizes throughout the week. I got the idea to make Lego shaped crayons from Pinterest. To make the "Legos" you need Lego ice cube tray and crayons from the dollar store. If you click on the picture you will be linked to instructions on how to make them. I just got my Lego ice cube tray in the mail and I plan to make the Lego crayons sometime this week! The picture above is of juice boxes, but I think it would be super cute to wrap miniature candy bars and put them in staff mailboxes with the "School counselors help students build bright futures!" theme message attached. I am seriously contemplating doing this to a pair of heels for National School Counseling Week. How funny would it be as a student to see your School Counselor in these?! Another clever way you could put a message in staff mailboxes! I hope these Lego themed ideas spark your creativity for National School Counseling Week! 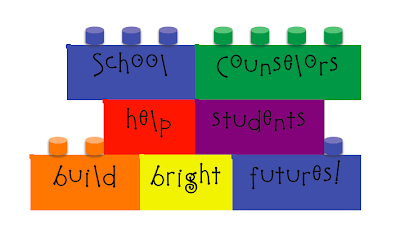 How would you use a Lego theme to celebrate National School Counseling Week? What events or programing are you planning for National School Counseling Week? February 6th - 10th is National School Counseling Week! I just added a new commenting platform to School Counselor Blog called Disqus. I think Disqus will vastly improve the way people interact with School Counselor Blog. The biggest change and the thing I am most excited about is now you can share pictures and videos in the comment section! I have been wanting to host contests on my blog where people upload a picture to enter, and now I have that option! I am working on some future posts based on your School Counselor Blog Facebook Page feedback! I plan to write a post about National School Counseling Week ideas and ideas for pumping students up for state testing. So, now you will be able to share pictures of what you are doing on School Counselor Blog as well as Facebook or instead of Facebook if you do not use Facebook. I encourage you to try out the new comment section! Leave me a message on this post and let me know how you like the new commenting platform! If you are feeling inclined you can upload a picture or a video! I would love to see how it works. My Current School Counseling Office "Show and Tell"
On the School Counselor Blog Facebook Page we are sharing pictures of our School Counseling Offices in the School Counselor Blog School Counseling Office "Show and Tell!" If you are a regular School Counselor Blog reader, you probably know I used to have a small classroom as an office. It was an amazing space and I was able to do so much with it. I now have a much smaller office in a suite with the other school counselor I work with and the school social worker. I have had to be creative with my space since I downsized. It is still hard to fit everything it... but I am beginning to adjust. This is a view of the door leading into my office. I have my career area right beside the door. I also have applications for 8th graders to apply for 9th grade programs. Here is a view of my desk and the far right side of my office from the door. I used clear storage containers to put lots of materials and supplies in them. I used construction paper and my crayola slick stix to make the labels on the drawers. Here is another view of my desk area and the far right side of my office. It is a little hard to see, but I can't push my chair in the whole way because I have books and binders under the desk where feet should go. I love the banner that says "Children need to be seen, heard, and believed." My intern last spring designed it for me as a gift (from VistaPrint)! Here is a view of the left and back corner of my office. I maximize every ounce of space! I use window coverings, window sills, etc to display student work and resources. You can see my "Kid Drawn Emotions" feeling posters on the wall. On the curtain there are mini goal mountains girls in one of my groups made. This is a view of the left side of my office. I purchased chairs for the table because the chairs that were provided for me took up to much room. I was able to get ottomans at Target that have storage in them that I use for seats for one side of the table. The other side of the table has folding chairs that I purchased. I keep an extra folding chair behind the door. 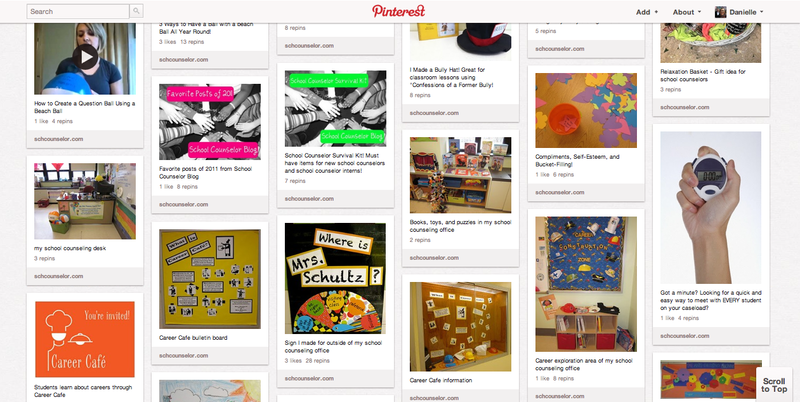 There is a good shot of my "Feeling Puzzled" bulletin board and my "Where's Mrs. Schultz?" sign! I would love to hear your comments and ideas about my office! I would also love for you to share a picture of yours on the School Counselor Blog Facebook Page! Comment below, tweet, contact Danielle, or share on the School Counselor Blog Facebook Page! I had a meeting with local school counselors today. We were talking about our school counseling offices... 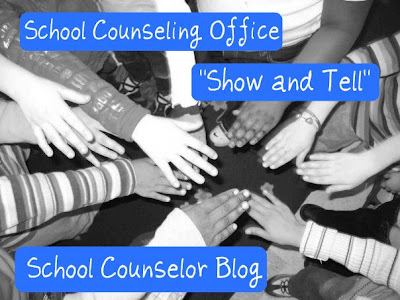 I would love for us to do a "Show and Tell" of our school counseling offices! Your mission, if you choose to accept it, is to take a picture (or a few!) of your school counseling office. Then, upload the picture on the School Counselor Blog Facebook Page. In the comment section of your picture, you can give a description of your office, what grades you serve, some of your favorite (or least favorite) things about it, and anything else you want to share! Let the School Counseling Office Posting begin! If you don't have a Facebook account, you can share your office pictures on Pinterest, Twitter, and Google+ too! (If you don't have any of those and would still like to share, email me at danielle@schcounselor.com). The First School Counselor Tweet Chat of the New Year was held on January 3, 2012 at 8pmEST! We chatted about school counseling New Years resolutions and soultions. We also chatted about ideas for celebrating National School Counseling Week! School Counselors shared tons of great ideas and resources, including ideas for parent involvement and starting a Career Cafe at your school! Check out the full chat transcript! The next School Counselor Tweet Chat is on February 7th at 8pmEST. We will be chatting about Tech Savvy School Counselor Essentials! The first School Counselor Tweet Chat of the New Year is Tuesday, January 3, 2012 at 8pmEST! 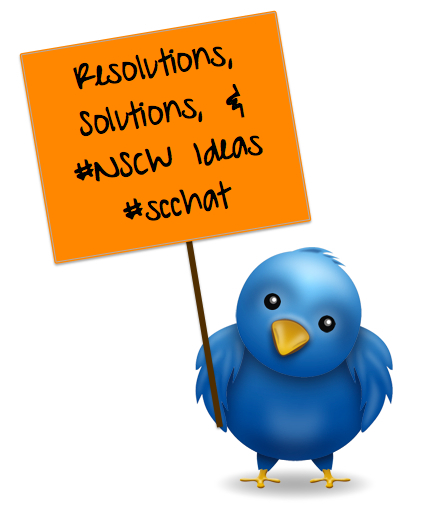 The topic of the School Counselor Tweet Chat this month is Solutions for Your School Counseling New Year Resolutions and Ideas for Celebrating National School Counseling Week. I will be moderating the chat. I am excited for you to share your ideas and participate in the First School Counselor Tweet Chat of the New Year!